Aloha everyone! I grew up eating alot of Chinese & Japanese Food. My amazing mom used to whip together 10 course Chinese meals like most people make a hamburger. Because my Mom is now retired, these days she just makes reservations. 15 minutes to soup time! And yes, I have pink chopsticks! One of my favorites is Noodle Soup. I love hearty soups because the it warms you up, the clear broth is healthy as compared to fattening cream soups, and sometimes it’s fun to put the soup in a mug with chopsticks and have dinner curled up on the couch. You can make this soup with either traditional Chinese noodles which are thinner or Udon noodles which is a type of thick wheat flour noodle. Heat pan with 1 Tbs. canola oil, add garlic and green onions. Quickly stir fry Kale or your favorite veggies. Pour in soup, add remaining ingredients except for fish (or chicken). Gently stir. Bring to boil. 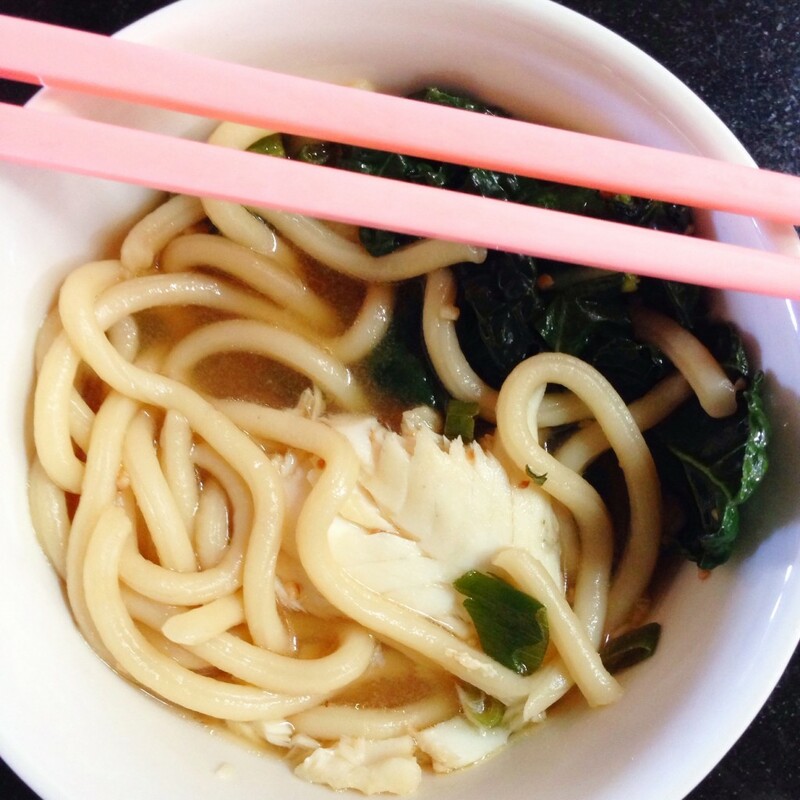 Add Udon noodles and gently place fish (or chicken) in broth, lower to simmer, cover and poach fish for 10 minutes. YUM! it only takes about 15 min. See the white chunks of fat? Yikes. My mom originally made this soup and served it with rice and “lop cheung” or Chinese for full fat pork sausage, as the protein. I never liked it very much. It’s super fattening, high sodium, nitrate loaded sausage. As kids, we literally thought the big clear chunks in the sausage were jello? Yikes. This contains high amounts of MSG and nitrates. As kids, we were unaware and our parents not as educated on nutrition. I never eat this now. Of course, I modified this recipe so I could enjoy it, eat healthfully and serve it to my family. Here is my modified recipe on one of her soups, I use clean protein and more of it, it’s lower in sodium and higher in protein and vegetables.